Last night at the Emmys, Matthew McConaughey and Woody Harrelson, two stars of the HBO series True Detective were on stage handing out the award for the best actor in a movie or miniseries. The duo exchange lighthearted and heavily-scripted banter with mixed results. The joke didn’t go over very well, with McConaughey quickly adding “Was that too much of an inside joke?”. But while plagiarism humor rarely goes over well, ensuring that my career as a stand up comedian is dead in the water, this joke died an especially painful death. Whether it was because of the material, the subject matter or that the audience was uneasy with the flippant attitude regarding the allegations against the show, is a matter up for debate. But what it did do was put the allegations back in the spotlight and introduce a lot of people to the story, many of whom had not heard about the allegations against True Detective or have connected the show with plagiarism in any way. Since, since McConaughey and Harrelson brought the controversy back to the forefront of everyone’s minds, it’s worth taking a look at what exactly the allegations are and see if the two actors should be making jokes about them at all. The main allegations come from Mike Davis, editor of The Lovecraft eZine, and Jon Padgett, who founded the site Thomas Ligotti Online. 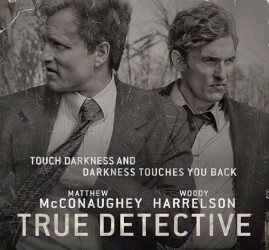 In the original article, the duo claimed that McConaughey’s character, Detective Rustin Spencer “Rust” Cohle, has several philosophic passages that closely mirror passages from The Conspiracy Against the Human Race, a non-fiction philosphy book by Thomas Ligotti. We became too self-aware. Nature created an aspect of nature separate from itself. We are creatures that should not exist by natural law. We know that nature has veered into the supernatural by fabricating a creature that cannot and should not exist by natural law, and yet does. While the two acknowledge that the copying doesn’t rise to the level of copyright infringement, they claim that True Detective‘s author, Mic Pizzolatto, acted unethically and doesn’t deserve an Emmy for his work. All in all, the duo point to nearly a dozen examples where they feel True Detective pulled from Ligotti’s work without attribution. However, the accusations center around philosophy and ideas, with very few matching words shared between the book and the TV series. The philosophical thoughts expressed by Rust Cohle do not represent any thought or idea unique to any one author; rather these are the philosophical tenets of a pessimistic, anti-natalist philosophy with an historic tradition including Arthur Schopenauer, Friedrich Nietzche, E.M. Cioran, and various other philosophers, all of whom express these ideas. So who is right in this? The answer is a complicated one but to get there we have to look more closely at the show and the background of these claims. Note: I have not seen True Detective. Everything below is based on my understanding of the show from various commentators online. If any fans of the show want to add clarification, please feel free to leave a comment or send me an email. There are several things to keep in mind about True Detective as a TV show. First is that it is very dense with literary references. So much so that, long before the plagiarism allegations, fans were having fun picking out the references in the show. Ligotti is far from the only work referenced in the show without explicit citation. This raises the question about why the use of philosophy from Ligotti’s work might be considered plagiarism but other allusions are not. In fact, that’s exactly how the use of Ligotti’s philosophy was treated initially. On January 30, Michael Calia at the Wall Street Journal wrote an article pointing out the similarities. The word “plagiarism” was never used, instead, it was an analysis of how Ligotti’s philosophy could impact the character of Cohle and the show. That article was followed up on February 2nd article where Calia interviewed PIzzolatto and he spoke openly about the influence of Ligotti on his work. He also referenced several others authors that he felt had an impact on the show and its writing. According to Padgett, Pizzolatto only discusses Ligotti when directly asked and, further, he claims that he sent the results of his investigation to Calia, which prompted the follow-up interview. True or not, the comparisons that Davis and Padgett make are not helpful. First, the duo turns its attention to the University of Cambridge definition of plagiarism. While Cambridge is a great school, comparing the rigor standards for an academic work to that of a fictional TV is out of line. Second, the duo compare Pizzolatto’s alleged plagiarism to that of former novelist Kaavya Viswanathan. While the fiction-to-ficiton comparison is more appropriate, Viswanathan was accused of verbatim and near-verbatim plagiarism of dozens of passages spanning the whole of her work. In short, Viswanathan is not a similar case. What Davis and Padgett have is a very interesting case study. Their findings raise serious questions about the lines of authorship, originality, homage and reference in a TV series. True Detective pushes a lot of these boundaries willingly and intentionally, referencing outside literature frequently. To leap from that and call Pizzolatto an intentional and malicious plagiarist that’s out to steal credit for Ligotti’s work stretches the evidence past its breaking point. Given everything else we know about the show, it’s clear that clear that Pizzolatto is no Jonah Lehrer or Jayson Blair (both of whom were in journalism regardless). At worst, he’s a remix artist that fails to adequately cite his sources, even if he uses them with a wink and a nod. Most likely though, he treads deep into the waters of allusion and homage, not plagiarism, though it can often be difficult to tell the difference. To be clear, Davis and Padgett do raise interesting questions about True Detective and how it uses it source material. Furthermore, I agree that it would be ideal if Pizzolatto did more to ensure that his fans knew about Ligotti’s work, both so they could enhance their understanding of the character and learn more about Ligotti himself. Where I think Davis and Padgett jumped the track is making the leap to calling Pizzolatto a plagiarist and drawing false comparisons between True Detective and academic plagiarism as well as very different types of plagiarism in fiction. In the end, I agree with David Haglund at Slate. Where this could have been an interesting conversation about inspiration and authorship, Davis and Padgett tried to push forth a dubious plagiarism claim that derailed the conversation. Furthermore, it drew attention away from the show’s many other references and what Haglund correctly refers to as its pastiche-like construction. After all, if Pizzolatto plagiarized Ligotti, he also likely plagiarized a dozen other sources that were referenced without attribution. So, I’ll end it where Haglund did in his article. While the ethics of what Pizzolatto did is up for debate, along with the idea of this heavy-referencing literature in general, to call it plagiarism is disingenuous and distracting. There’s no evidence of an attempt by Pizzolatto to take the work of others and pass it off as his own. If it’s wrong, it’s a new type of wrong and with it likely goes an entire genre of creative works that spans literature, music, TV and movies. So while it’s a conversation worth having, it’s one best had without a lynch mob.